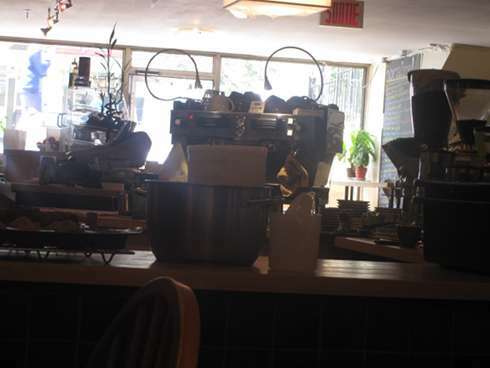 At 1st Glance Situated on Avenue du Parc, just south of Fairmount, café Resonance is a short set of stairs down to a semi-basement café. Inside you see ample seating, along with a stage in the back with a piano that local musicians will often come in and play. There is an order counter at the right when you come in with a chalkboard menu of some items and a mini paper menu with the items for brunch. Because we were famished, we went a little crazy and ordered a bunch of stuff from the menu. Before we started eating we were a little thirsty and had to get our morning coffee on. The coffee was priced at $2.61, and is not drip so ,no free refills. Lattés are $3.69 and you have options of soy and almond instead of cow milk and smoothies are $4.78. 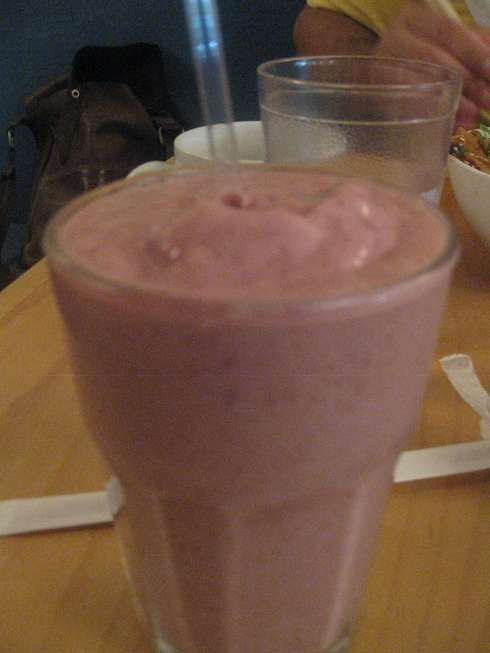 The smoothie was a multi-fruit mix and had an impressive consistency which helped in it’s speedy race to the bottom as we drank every last drop. 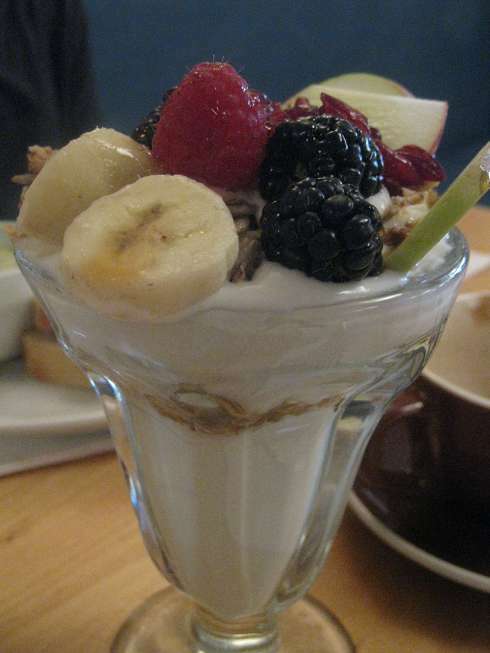 We then progressed to something more solid like a coconut yogurt ($6.08) which was served in a tall glass with granola and fruit. I did not find the coconut flavour overly pronounced which is actually a good thing since the yogurt was perfect on its own. 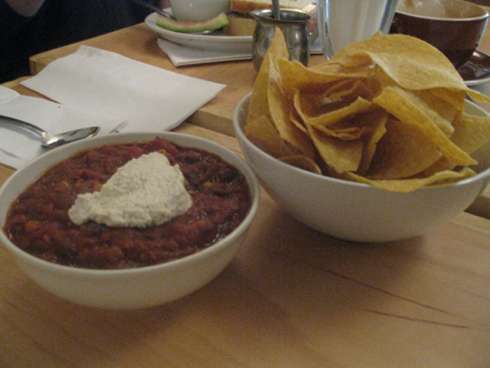 We ordered a few things that favored more the lunch side of things and had the chili ($6.08). It was quite tasty, filling and came with a side of nachos. 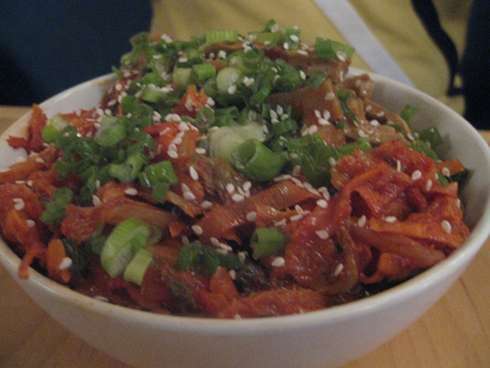 This dish, although not your classic morning dish, went well with the variety of other dishes we had. 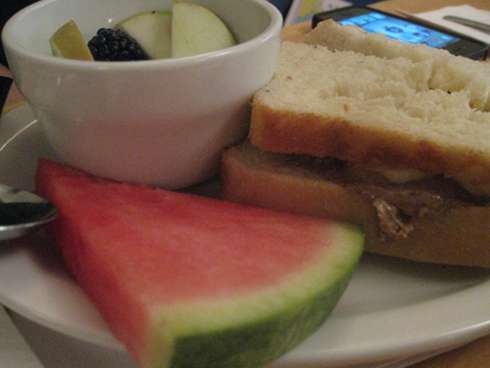 From the brunch menu, we opted for an almond butter and banana sandwich ($6). Despite the presentation not being overly impressive, the taste was. Almond butter is a nice creative use of a healthy ingredient chalked full of energy. It also came with a side of fruit which was quite generous and made for a value option. 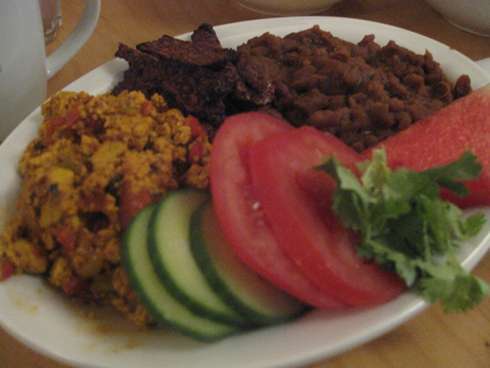 The tofu scramble with bacon tempeh dish ($9.5) was a wonderfully spiced tofu scramble and the bacon-looking tempeh had a nice smoky flavour and a side of beans. The dish had cucumber and tomato on the side but it was not necessary since the other parts of the dish stood out on their own. Service Our waiter was very helpful and informed us on tons of options. Even the staff at the counter where we placed our order was chill and looked happy to be there. I say that last line because sometimes I go out and the staff doesn’t seem happy to be working there, but they did here. Vegetarian Not only is this place vegetarian but it has vegan and has gluten free items. 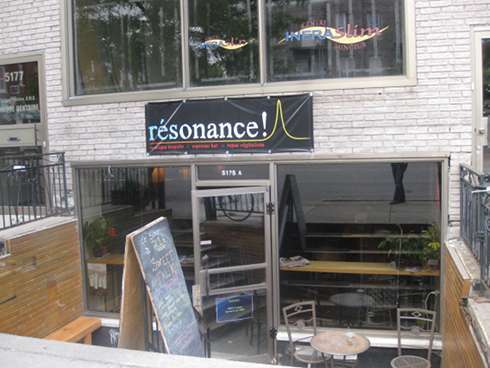 Wrap up Resonance café is a nice addition to the vegetarian/vegan brunch scene. If you don’t know about it yet then you should try it out. The prices are very fair, food is tasty, healthy and you have lots of options.